These are studies when I was an undergraduate or master student. I studied Japanese macaques in Mt. Hieizan, in the suburbs of Kyoto, as my graduate study. There is a very famous temple of 1200 years old here, and monkeys there are non-systematically provisioned by the tourists who visit the temple. Monkeys also raid crops in the foot of the mountain. I clarified that these artificial food enhanced the reproduction of this population. Fieldwork was conducted from April to November 1996. 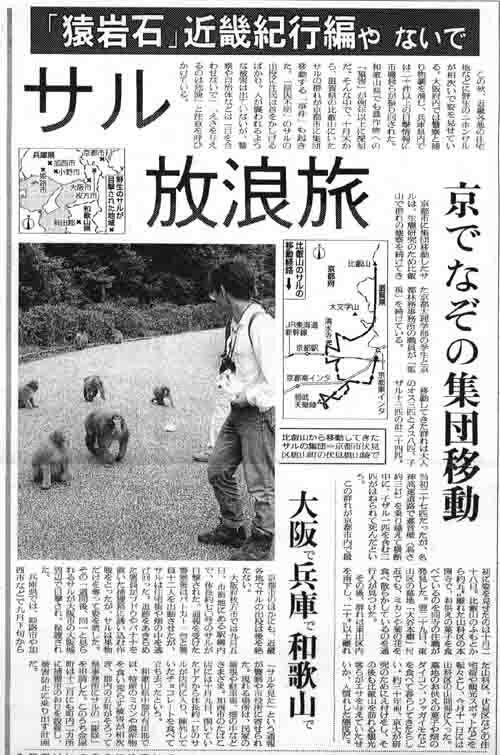 This is a Japanese newspaper, telling that a Japanese macaque troop suddenly appeared in the tomb of an emperor. I am the man in the right of the photo. Regrettably, I have not seen the macaques in Hieizan since I started studying in Yakushima, although I saw the mountain from the window of my laboratory in Kyoto everyday! I think it was a good opportunity for me to work not only with completely wild monkeys like the ones in Yakushima, but also with these 'urbanized' monkeys. My master's thesis was on the age difference in the food intake and dietary composition of Japanese macaques in the western coastal forest of Yakushima. During the observation in this area, mass mortality of Japanese macaques occurred. Mortality of 115 monkeys belonging to the five intensively studied groups between 1998-1999 reached 61%. This finding revealed that primate populations fluctuate over the long term in a seemingly stable habitat without any artificial disturbance. Western lowland forest of Yakushima is the long-term study site for Japanese macaques. It was a good place to practice various research skills for young primatologists, like me at that time. However, it was quite difficult to find topics which had not been studied by others. This is the dead alpha-male of my study troop. According to the necropsy, the cause was diagnosed as pneumonia. His death was the beginning of the mass mortality, but I did not realize until finishing the thesis and going back to Yakushima. My study troop had completely died off at that time. 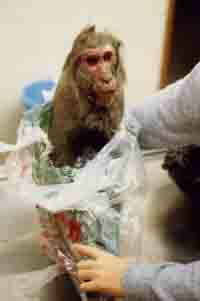 I had hard days when I could not see any of my monkeys in the forest but found only skeletal carcasses day after day.